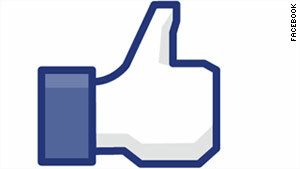 The parents of a baby named 'Like' say they just like (pun intended) the meaning behind the name. Israeli couple Lior and Vardit Adler name their baby girl "Like"
(Mashable) -- First there was baby "Facebook" and now this: An Israeli couple has named their kid "Like." Let the Valley Girl jokes ensue. The Israeli news source Galgalatz reports that Lior and Vardit Adler are the proud parents of a bouncing baby girl named after the Facebook Like button, which recently celebrated its first birthday. Apparently, the parents were looking to call their daughter something unique. The moniker is not meant to be a gimmick, and they say that they're not shilling for Facebook. They just like (pun intended) the meaning behind the name. The Adlers are hardly the first people to saddle their kid with a suspect name. One man offered to name his son Batman if he could get 500,000 people to become fans of his Facebook Page, and another couple named their child Facebook in honor of the role the social network played in the revolution in Egypt. Granted, naming your child something unusual is not relegated to the realm of social media -- apparently "Brooklyn" is an extremely popular name -- but the name choice certainly is out there. What do you think? Would you "Like" the name Like?